For your next conference or convention… introducing our fun, new big event service: “Behind-the-scene” treasure hunts. “Treasure hunts” are clue-based games where puzzles lead people to various locations in a given area. The key is the clues, which can be in Pig Latin, code, cipher, anagrams, trivia, etc. Think National Treasure or Goonies. “Behind-the-scenes” means that the game is happening “a-synchronously”. Participants don’t miss any conference sessions or activities! 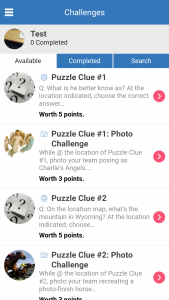 In a “behind-the-scenes” game, participants get into small teams, download a treasure hunt app, and solve clues throughout the event, whenever they see fit. –Our signature treasure hunt app features a variety of fun challenges, a live leaderboard and a live feed. It also allows for instant media downloading at the end, so we can conclude your event with a slide show. –The clues are all worth points based on difficulty, they all stand alone and are independent, and participants can solve the clues in any order that they like. The team with the most points at the end, wins. –Some clues are puzzle based, leading to site-specific locations at your events. Some are photo challenges. 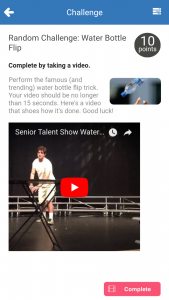 Some are video challenges. Some are even multiple choice quizzes. CLUES CUSTOMIZED TO YOUR CONFERENCE, upon request. Pricing: Our fees are based on your estimated headcount.